Last week I blogged about the history of the idea of a space elevator that could reach all the way beyond an anchor in geosynchronous orbit. Cargo and people could be moved to and from orbit in elevator cars traversing the elevator. Today I am going to talk about current work and future plans for such a construction. A major international study was carried out and a report issued in 2012 concluded that it would be possible to build such a space elevator but the best results would require international co-operation. Many Japanese universities have been working to solve technical problems for such a project. A group at Kanagawa University is developing designs for the robotic cars that will climb the elevator. Obayashi is one of five giant Japanese construction firms. It has its headquarters in Minato, Tokyo but was established in 1892 in Osaka. It operates all over the world. 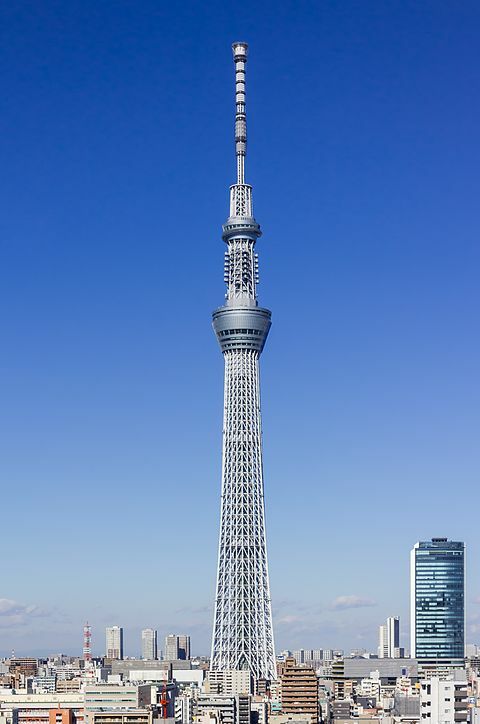 One of its projects was the Tokyo Skytree which is a broadcasting, restaurant and observation tower in Sumida, Tokyo. It is the tallest tower in the world at a little more than two thousand feet. Obayashi has announced plans to build a sixty-thousand-mile high space elevator. Robotic cars will use magnetic linear motors to carry cargo and people to a new space station at fraction of the current cost of chemical launch vehicles. Using current technology, it costs about ten thousand dollars a pound to send a payload into Earth orbit. Estimated cost of sending that same pound to orbit via space elevator is about a hundred dollars. They estimate that the trip will take seven days to reach from Earth to the space station. The elevator will be constructed from carbon nanofibers. A R&D manager at Obayashi said, "The tensile strength is almost a hundred times stronger than steel cable so it's possible," Mr Yoji Ishikawa, a research and development manager at Obayashi, said, “Right now we can't make the cable long enough. We can only make 3-centimetre-long nanotubes but we need much more... we think by 2030 we'll be able to do it." The space station reached by the elevator could be host to small rockets that could carry out orbital missions without the need for huge amounts of fuel to boost such rockets from the ground to Earth orbit. Solar power satellites have been discussed for decades as a source of inexpensive, pollution free power. With the advent of a space elevator, the cost to construct such solar power stations would plummet. Space tourism has also been discussed for decades. Obayashi is designing robot cars for elevators that can carry as many as thirty people. Personally, I don’t think that it will be a major industry even with a space elevator. A space elevator is a fantastic idea which just might be possible. It would make exploration and exploitation of space much cheaper and easier. However, beyond the technical problems, there are many political, economic, and security issues that will have to be solved in order for it to become a reality.